Any average, well drained soil enriched with compost. Winter hardy. Becomes dormant from fall to spring. Drench plants with a water soluble organic plant food one month after setting them out. Rocket, Brussels Sprouts, Cabbage, Cauliflower, Kale, Sage, Strawberry, Ageratum, Dianthus, Portulaca and Dahlia. Start with purchased plants, or start seeds indoors in early spring. 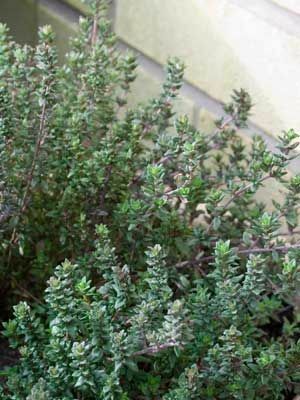 Good culinary thyme can be grown from seed, but some creeping forms are propagated only from rooted cuttings or divisions. Creeping forms make sturdy ground covers. Bees are attracted to pink thyme flowers. Gather sprigs as needed in the kitchen. Gather stems for drying in summer, before the plants bloom. Plants are often short-lived, so root a few stem cuttings each spring to always have vigorous young plants.